In first grade, there is literacy and math homework nightly, Monday through Thursday. Below are more detailed instructions for homework. 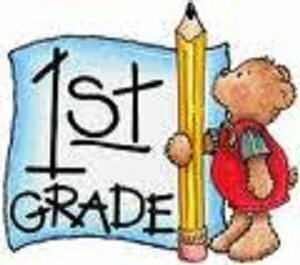 Your child will bring home a "just right" book in a book bag on Monday, Tuesday and Wednesday night. This book should be at your child's independent reading level, so your child should be able to read this book without much help. Books should be read and then reread by your child. Take time to discuss the book with your child, asking their favorite part or favorite character, discussing if there was a problem and solution, looking back at tricky words, retelling important parts of the story, etc. On Thursday night, your child will bring a "choice book" home in their book sack. This book may not be at their independent level, so please take the time to read this book to your child. Even though they are growing into independent readers in first grade, they still LOVE to be read to! It is very important that each book is returned to school with your child each morning, so that they can read this book during Readers' Workshop and take a different book home each night. There will be no written word study homework assigned with a date due back, however the students will be assessed periodically on introduced spelling words. When word study folders come home in your child's backpack, please quiz them to check progress and better prepare for these assessments. Your child will need some help with the directions for each assignment and may sometimes need support in completing the assignment. If your child is really struggling with the assignment, please send it back to school incomplete with a note from you. Please do not be alarmed if your child has difficulty with an assignment, as we will revisit each math skill throughout the year. Also, please see the Eureka Math Tips page for more information.